Rigor. Relevance. Cognitive Verbs. Instructional Shifts. If your district is even remotely on the ball in preparing you and your students for Common Core implementation, you've heard these buzz words, and hopefully know some of what more will be expected of our students operationally. But what does that LOOK like? I think the number one question I hear whispered around me during Common Core training sessions has been pleas for examples of lessons integrating the standards. Here are three lesson resource websites that are navigated according to math instructional and practice strands. "Illustrative Mathematics provides guidance to states, assessment consortia, testing companies, and curriculum developers by illustrating the range and types of mathematical work that students experience in a faithful implementation of the Common Core State Standards, and by publishing other tools that support implementation of the standards." "Gold Seal Lessons provide teachers model, proven lessons ranging from one day to three weeks that they can implement. Each lesson is designed to teach to specific standards/benchmarks/objectives and centered around a highly motivating theme, activity, or project. Lessons are typically multidisciplinary and deal with real-world situations or problems. Additionally, Gold Seal Lessons should challenge students to learn and perform in a variety of different ways. They may be asked to research, write, compute, model, demonstrate, build, survey, or report in a variety of academic, technical, work, or community environments." "Inside Mathematics is a professional resource for educators passionate about improving students' mathematics learning and performance. This site features classroom examples of innovative teaching methods and insights into student learning, tools for mathematics instruction that teachers can use immediately, and video tours of the ideas and materials on the site." All three of these sites feature lessons you could use in your classroom next week. 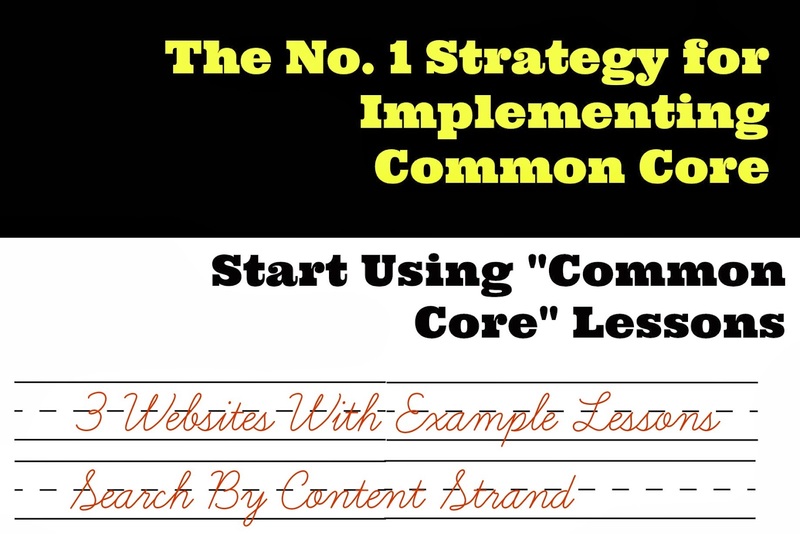 The best way to begin implementing common core or anything new in your classroom is to start implementing common core in your classroom.